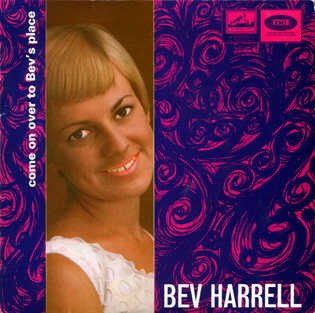 Petite (4'9") blonde pop vocalist Bev Harrell was one of the most popular female solo singers in Australia in the late 1960s. Bev began her career on radio, starting out when she was just six in the children's radio talent series Kangaroos on Parade in her hometown of Adelaide, South Australia. Her debut single was a cover of "What Am I Doing Here with You?" (b/w "You Really Didn't Mean It"). The A-side, originally a hit for Johnny Rivers, was written by singer-songwriter-producer P.F. Sloan; his pop career went back to the late 1950s and he also scored major hits as a writer (with partner Steve Barri) including Barry McGuire's "Eve Of Destruction" and Rivers' "Secret Agent Man" (which was also inimitably covered by DEVO). Many of Sloan's songs have been widely covered, including some done by Australian acts -- "Anywhere The Girls Are" was covered by Ol' 55, Surfin' Craze was covered by The Silhouettes and "These Are Bad Times (For Me And My Baby)" was covered by The Groop. 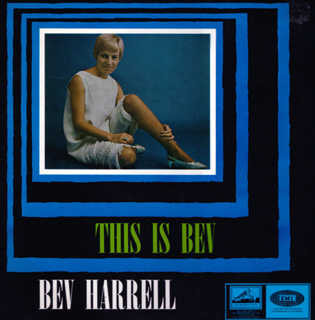 Bev's debut was released in late 1966, and it became a national Top Ten hit, charting in most cities in January 1967, reaching #6 in Sydney, #10 in Melbourne, #5 in Brisbane and #1 in Bev's hometown of Adelaide. It also earned her the prestigious "Best Australian Female Vocal" award in the 1966 Australian Record Awards. As mentioned above, Bev's boyfriend at this the time, Daryl Sambell, was also her manager. This led to a fateful meeting on 29 April 1967, when Bev performed at a dance in Cohuna in country Victoria, sharing the bill with a Melbourne band called Strings Unlmited. Sambell was impressed by the band's lead singer -- he asked for his phone number and told him he could make him a star. The young man thought nothing more of it, but a month later Sambell called and arranged a meeting. As a result, when the singer's group broke up a few months later, Sambell began managing him and he went on to become Australia's most successful male singer -- John Farnham. Meanwhile, Bev's own career had taken off thanks to her hit single, and she gained considerable exposure as a supporting artist on tours by international names including Herb Alpert & The Tijuana Brass, Winifred Atwell, The Rolling Stones and Roy Orbison. Like many pop stars at this time, Bev's success led to offers for commercial product endorsement, and she was hired to promote the famous Hills Hoist rotary clothes line. Still photos from this campaign can be found on Bev's website and an excerpt from a TV ad recently (Aug. 2004) featured in a story on the Hills Hoist on the ABC-TV social History program Rewind. Bev scored two more national Top 40 placings among her subsequent releases. Her second single was a Barry Mann and Cynthia Weil song "Come On Over To Our Place" (#25 Sydney, #27 Brisbane, #14 Adelaide, March 1967), originally recorded by The Drifters in 1965 as "Come On Over To My Place". It was followed by "You Baby" / "You Are The Love of My Life"(June 1967), which did not chart. During the year EMI also released an EP, Come On Over To Bev's Place and the LP This Is Bev. 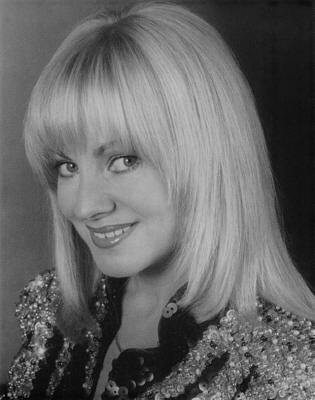 Bev's next single "One in a Million" / "Give Me Time" fared significantly better, reaching #28 in Sydney, #8 in Brisbane and #13 in Adelaide in February 1968. The A-side was written by the hit-making British writing and production duo Jackie Trent & Tony Hatch. The song was also recorded by (and presumably written for) Petula Clark -- for whom Trent and Hatch most many hits -- but it appears that Bev's version of the song was in fact the first to be released -- Petula's version was recorded in March 1967 but was not released as a single until August 1968. 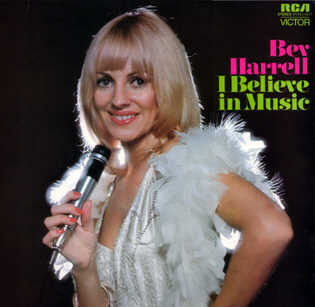 Unfortunately, none of Bev's subsequent EMI Singles made the charts; they were "Mon Pere" / "At Times Like These" (July 1968), "One Way Ticket" / "I Am the World" (October 1968), "Everybody Needs Love" / "My Little One" (April 1969) and "The Looking Glass" / "Yes I'm Ready" (February 1970). In 1969 and 1970 Bev was one of many Australian female entertainers who were sent to Vietnam to entertain Australian troops, along with coleagues such as Pat Kennedy and Anne and Sue Wills. Their recollections were part of a feature on the ABC-TV program Dimensions In Time in 2002. A photo of Bev on-stage at the Australian base in Nui Dat can be seen HERE. In 1970, she travelled overseas, and cut a single for the US Bell label. She toured through Europe, Canada (where Bev had her own television special "Two New" on Toronto TV), the Caribbean, South Africa and South East Asia. In January 1971 in London, Bev released a single on Bell, "Back To The People" / "Travelling Easy". The single is of interest to Bee Gees aficionados because the A-side was co-written and the single produced by Maurice Gibb. According to Bee Gees expert Joseph Brennan, Bev did not know the Gibbs and was simply offered the song by their publisher. Later that year, as England's representative in the 1971 Tokyo World Song Festival, Bev took out the 'Outstanding Composition and Performance' award. Returning to Australia in 1972, she signed to RCA and issued three singles, "It Was Easy" / "The Right Thing to Do" (June 1973), "Carols by Candlelight" / "You've Got to Save Me" (October 1973) and "Mon Pere" / I Believe in Music" (March 1974), as well as the 1974 LP I Believe In Music. Her last single, "Bring Back Those Memories" / "Sing", was released on the Polydor label. Today, Bev lives back in Adelaide and continues to work regularly on the musical stage and on the club and corporate circuit. She was awardedthe Order of Australia (OAM) in 2006.